Merchants and Issuers both benefit from the solution proposed by the Debit Network Alliance. The chart shows the benefits for each stakeholder. 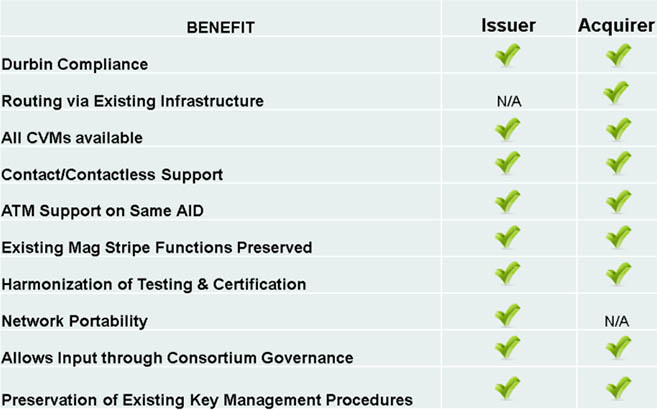 Compared to other solutions, the Debit Network Alliance one provides Issuers and Merchants with the most benefits. For Issuers, the ability to easily switch network brands, listed above as “Network Portability” is a key benefit. For merchants, the ability to route transactions via the existing infrastructure as they do today is a key benefit. All in all, both Issuers and Merchants are in a better position to manage their businesses as they see fit with the Debit Network Alliance solution.